White Crow Books, 2016 (1986), 237 pp. White Crow Books, 2016 (1987), 237 pp. Many readers will be familiar with Max Payne, whose obituary we published in this Review last summer, and who was a regular contributor of book reviews at the interface between science and spirituality. Fewer will now know about Peter Leggett (1912-1995), one of the founding members of the Network and an exact contemporary of George Blaker at Trinity College, Cambridge. Peter was a mathematician who eventually became vice chancellor of Surrey University, where he held some early meetings of the Network, including a conference on reincarnation in 1974. He was a great friend and mentor to me, and was the first chairman of the Network Council before Peter Fenwick. I remember him once telling me about a conversation he had had with a bishop about reincarnation (the forgotten truth of the first book), where the bishop had told him that if he accepted reincarnation, he would have to changes his whole theology! 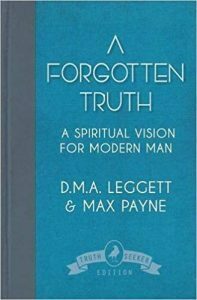 The subtitles of these books – which I read with profit when they originally came out – are significant in referring to a spiritual vision for modern man and the integration of experiment with experience in arriving at a coherent worldview. Both Max and Peter epitomised the Network approach of balancing rigour with openness, and indeed it was Peter who invited Max to join the Network after the initial meeting recommended writing letters to possible members. The books draw on a wide range of reading, not all of which will still be familiar to contemporary readers. Sir Kelvin Spencer, another founding member, provides the forewords to both books. He quotes Sir Alister Hardy’s remark that our civilisation has been built upon the spiritual interpretation of the world and that if the majority of the population come to have a materialistic view, the whole nature of our way of life may change, and not for the better. He urges readers to remember that we are essentially spiritual beings, and that the spirit can move mountains. He also observes that scientific materialism has evacuated our sense of purpose, but there is no intrinsic reason why science cannot be combined with a spiritual outlook. In A Forgotten Truth, Peter begins with a discussion of what constitutes evidence, widening his view beyond the repeatability of science and arguing for the validity of cumulative evidence of reliably recorded happenings or experiences. He builds on this in a discussion of the distinctive roles of science and religion before considering evidence from the Scriptures about the nature of God, fundamental principles and application. This leads him to formulate a hypothesis (p. 48) consistent with these observations that can then be tested by experience. His understanding of God is that from which all that is proceeds, while the relationship of a human being to God is likened to the cells of the body. Human beings are charioteers of their body, while the purpose of human life is learning lessons in a school of spiritual development. The purpose or end is an ever expanding and ever deepening consciousness. This provides an inspiring philosophy of life that is then discussed with reference to mysticism, psychology, biology, physics and the paranormal. The next chapter consists of extracts from talks by a discarnate teacher on various aspects of life; the tone is somewhat apocalyptic but sheds further light on the deeper nature of the human being. The second part, co-authored with Max Payne, discusses the implications of Peter’s hypothesis for religion, science and society in terms of the need for a new metaphysic and the necessity of spiritual evolution integrating both Western and Eastern perspectives. In conclusion, they argue that neither scientific humanism nor Christianity as normally presented can provide a compelling and realistic vision of the future. We need a new understanding based on the integration of science and spirituality, which is what this book provides in terms of a vision that will give purpose and meaning to human life. 1. Man is not just 5 pounds’ worth of chemicals and a lot of water. 2. Man, when alive, can function as a self-conscious being independently of his physical body. 3. Man’s consciousness survives the death of his physical body. 4. In the post physical death state man undergoes some kind of judgement/review of the life just ended. 5. Man evolves through a series of lives, the circumstances of which are interconnected. 6. Love, justice and tension exist at the heart of the universe. 7. Unity underlies all that is. In discussing the purpose of human life, Peter develops a further series of propositions suggested by the evidence he considers. He moves on to a more detailed consideration of Christianity and the relationship between Jesus the man in Christ the divine spirit. Next, he explores the subtle constitution of the human being and the purpose of life in terms of the expansion of consciousness, a vision he also shared with Sir George Trevelyan. The key, as explained in the last part, is application, and it is here that Peter tackles the thorny issues of evil, sin and suffering as well the wisdom derived as the fruit of experience. This brings him full-circle back to education and he quotes the UN Secretary-General U Thant in advocating an integration of Eastern and Western approaches so that there is equal emphasis on intellectual, moral and spiritual development. Given that the content of these books is perennial, even if many more books have been published in the intervening period, readers can profitably engage with the arguments and assess for themselves the extent to which they feel the reasoning is sound in the light of the evidence considered. This is classic Network thinking. Buy A Forgotten Truth here. 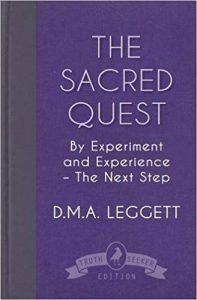 Buy The Sacred Quest here.